There's a common misconception that U.S. employees have become "job jumpers," especially over the last decade. Millennials, in particular, have somehow garnered a reputation for short stints, moving on to greener pastures at the soonest opportunity. While certain industries (retail, foodservice, and to some degree, the software and high-tech industries) may always be more prone to higher turnover than others, the truth is: U.S. workers are actually more loyal today than anytime over the past three decades. The average worker now holds the same job for 4.6 years, up from 3.7 years in 2002 and 3.5 years in 1983. So, if worker tenure is actually increasing, what's fueling the false assumption? Maybe it's because so many workers are just miserable in their jobs. At first glance, the latest data on worker engagement sounds quite promising—engagement rates have reached an all-time high since Gallup began tracking the statistics in 2000. However, a deeper look reveals a troubling deficit. That all-time high is abysmally low: less than one-third of workers are engaged at work, over half are "not engaged", and a disturbing 17.5% are "actively disengaged." When it comes to Millennials, there's an even stronger connection between the turnover misconception and lack of engagement. As the least engaged age group at 28.9%, Millennials seem to be the most frustrated employees, citing a lack of "opportunity to do what they do best" at work. So, while they're not actually leaving their jobs (perhaps out of fear of not finding another), there's a good chance they're thinking heavily about it. According to CareerBuilder, over 60% of workers say they're employed, but open to new opportunities. As an employer, that should be cause for great concern. While it's no secret that the 30-year tenure has gone the way of the guaranteed pension, the fact is the worker engagement/retention connection cuts both ways. According to a study published by the Harvard Business Review, employee engagement ranks in the top three success factors among best-in-class companies—higher than productivity, innovation, sales and marketing capabilities, and even strong executive leadership. In other words, lack of engagement can be a significant detriment to company success, not just individual employee satisfaction. 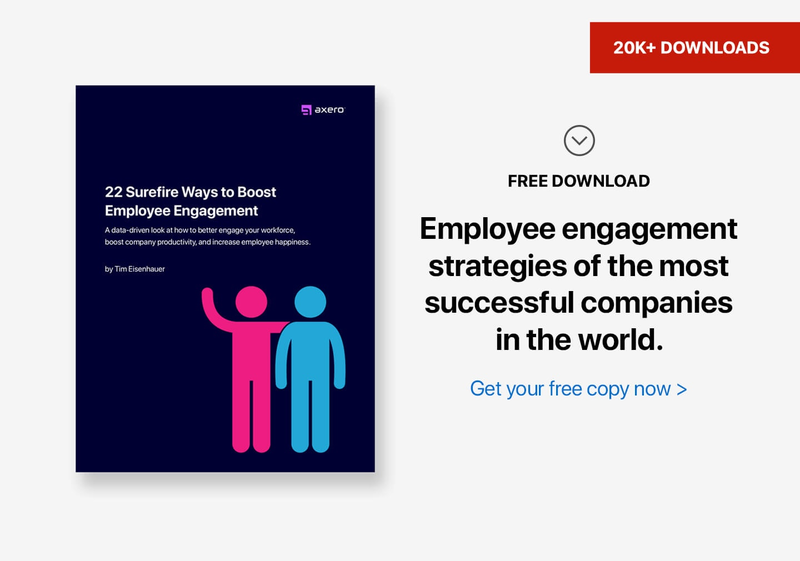 Because engagement is such a problem, and seems to be so closely tied to retention, maximizing employee engagement must be a critical priority for employers. And, even though the definition of "long-term employee" may not be quite what you expect—these days 3 years is considered "long term"—it's important to maintain an atmosphere that keeps employees engaged, excited, and motivated on the job, even after the "newness" wears off. Whether it's a new hire, or a team member with 15 years on the job, cultivating engagement is a vital business activity. Here are 6 employee engagement tips to help you retain your best team members. Providing opportunities for advancement is one of the top 3 factors in attracting new employees, and the number one driver of employee engagement in North America. It's easy to see why no one wants to be stuck in the same rut for the next 10 or 20 years—it's boring, monotonous, and it offers zero challenge. This can be a serious detriment to individual and company performance. Humans are not robots—we need new challenges, new opportunities, and change. While some companies are hesitant to invest in career training, out of fear employees will take that knowledge and go elsewhere, the fact is you can't afford not to do it. Not all employees you invest in will be there forever, but those who stay will make the investment worthwhile. And, there's no substitute for the positive reputation your company can gain by supporting career advancement. Even those employees who do leave will tell their friends and colleagues about how great your company is in supporting its employees' professional advancement -- and this can significantly help in your recruiting efforts. Establishing real goals that inspire ownership and commitment can be a strong motivational tactic. It can also help improve employee engagement by as much as 20%. In fact, performance management is the number two driver of employee engagement (after career opportunities), and studies show that people who set motivational goals are up to 75% more fulfilled in their jobs than those who set routine goals (as in, just working through your daily To-Do list). Working together with employees to set short, long-term, and stretch goals—realistic, yet aspirational targets that encourage employees to test their skills and leave their comfort zone without setting them up for failure—can provide outstanding motivation to keep them engaged over the long term. As noted playwright George Bernard Shaw once said, "The single biggest problem in communication is the illusion that it has taken place." Assuming that employees know what's going on inside your company is a huge mistake, and intentionally keeping them in the dark is an even bigger one. In a recent survey, communication problems ranked as the top three causes of negativity in the workplace, with lack of direction from management coming in at number one with 38%, followed by failure to communicate constant change, and poor communication overall. To maintain engagement, employees must communicate openly, honestly, and regularly, in the language and medium that employees will understand and most easily consume and digest. Give people the information they need to do their jobs well, and address their concerns sincerely and directly. Using a real-time platform like Communifire can provide an easy and accessible channel, but remember: for some topics, there's no substitute for a face-to-face conversation. Nothing kills motivation and engagement faster than someone who is constantly watching over your shoulder, micromanaging, or needlessly trying to hold your hand at every opportunity. Empower your employees to do their jobs like the adults they are. Work together to set goals so they know what's expected, and provide motivating incentives that will intrinsically encourage them to meet those goals, rather than using threat tactics and intimidation. Celebrate small victories to foster encouragement and give them some flexibility to work in the way that best suits them. This might mean telecommuting, flexible hours, or simply a personal style. Of course, you'll want to keep things in check to make sure these privileges are not abused, but by and large, most people will surprise you with how well they perform when given the chance. According to a Blessing White report, the main reason most people stay at their job is because they enjoy the work. In fact, 24% said having "more opportunities to do what I do best" is key to their job satisfaction. Take advantage of this by working harder to understand individual employees' personalities, their likes and dislikes, and by giving them roles and responsibilities that align with these traits. Google is famous for its 20% time, giving employees one day a week to work on passion projects or other things that don't necessarily fit within their usual job description. Of course, every day can't be "do what you want" day, but the more often you give employees "white space" to work on tasks they enjoy, the more likely they are to bear the brunt of the grunt work when it inevitably needs to be done. Never assume that you know what your employees are thinking. Ask them. Use surveys to collect feedback, and make sure gathering their feedback and input is a part of your quarterly (yes, quarterly – not annual) performance review process. Instead of just telling them how they're doing, ask them to also tell you how the company is doing in meeting their needs. Allow everyone to participate in the innovation and ideation process, weigh in on ideas and suggestions and provide feedback on problem-solving and solutions. Remember that finding your employees unique skillsets and personality traits, their likes and dislikes, should be an important priority. Use this as an opportunity to do so. Perhaps your accounting manager has a penchant for marketing. Or you HR team has a knack for understanding product usability. Take advantage of their knowledge and legacy with the company by bringing them into the innovation and decision-making process. And, by all means, build a knowledge management strategy into your company to make sure you're capturing and saving all of this priceless material. With employee engagement strategies now such a hot topic—and such a top priority for employers—many managers and executives mistakenly think that it's also somehow difficult or complicated. The truth is that, in most cases, keeping employees engaged is as simple as treating them exactly how you want to be treated. Ask for their input, maintain open lines of genuine communication, challenge them appropriately and support them as human beings and in their careers. Communifire provides the open dialogue that lets employees and management collaborate, support each other, and learn more about expectations and desires on both sides of the equation. While it's no substitute for face-to-face interaction, tools like Communifire provide the next best thing, especially for large and geographically dispersed companies.